One of the biggest debates that raged on among hardware enthusiasts before the Xbox's launch was in regards to what resolutions we could expect games to run at. You must first understand that interlaced NTSC television offers an effective resolution of close to 640 x 480 meaning that there would be no reason to render at above that resolution for the vast majority of the population. Because of the interlaced nature of NTSC video it is only necessary to have half of the horizontal resolution lines in the frame buffer at any given time which is why some PS2 games actually only store 640 x 240 images in the frame buffer. This unfortunately ruins the potential of the PS2 having any reasonable HD output at resolutions higher than 640 x 480 or what is known as 480i. The Xbox however was designed with support for so called high-definition (HD) resolutions in mind. Most PC users are used to resolutions such as 1024 x 768 but in the world of HDTVs, resolutions are measured in the number of horizontal scan lines. For example, on a 4:3 aspect ratio (width:height) TV, the resolution 1024 x 768 would be represented as 768p since the signal is non-interlaced or progressive scan (at any given time there are 768 horizontal resolution lines). The HD standards do not offer any 768p standard; rather the most popular are 720p and 1080i - both of which are 16:9 standards. The equivalent in terms of resolutions you're used to seeing would be 1280 x 720 and 1920 x 1080; the latter would be interlaced because currently no TVs have enough available bandwidth to offer a true 1920x 1080 resolution. The Xbox features a Conexant video encoder chip that supports the following TV output resolutions: 480i, 480p, 720p and 1080i. 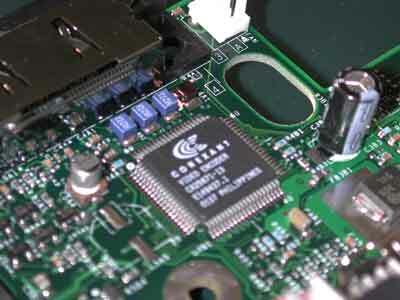 However the input of that chip is governed to a maximum (according to Conexant's tech-docs) of 1024 x 768. Note that the input resolution and the resolution outputted to your TV don't have to be the same, but if they are not the same you're just going to be scaling or shrinking the image and won't get any additional quality out of it. HD support is enabled through the $20 HD A/V pack. The pack comes with RCA audio and component video cables. 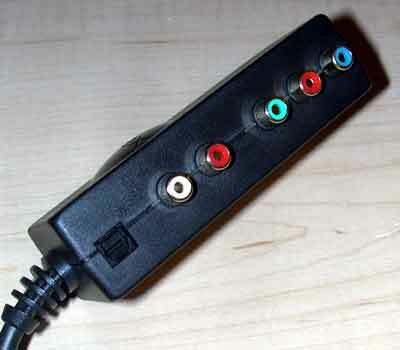 The connectors are as follows (from left to right): digital audio out (toslink/optical), analog audio out L/R, component video out (Y Pr Pb). All currently shipping Xbox games, as far as we know, are rendered internally at 640 x 480 and then sent to the Conexant chip which either interlaces the frames for output to a regular 480i or HD 1080i display or leaves the full resolution lines intact for every frame when being sent to a 480p or 720p output. This means that even for HDTV owners, 480p is the best you're going to get for now. Because of the sheer memory bandwidth requirements, 1080i doesn't make much sense for game developers. At 1920 x 1080 there are 153,600 more pixels (8% more) to be rendered than at 1600 x 1200 and we already know how memory bandwidth intensive 1600 x 1200 can be. Considering that the Xbox only has 6.4GB/s of memory bandwidth to work with, only in games with relatively small textures and low detail can we expect 1080i to be a reality. The much more desirable option is 720p. In 720p mode there are 135,168 more pixels to be rendered than at 1024 x 768 which is very easily done at above 60 fps by every card since the GeForce2 GTS. The problem you run into next is that most HDTVs don't support 720p but instead support 1080i. This isn't as big of a problem since the conexant chip can scale the output to 1080i and most TVs even scale unsupported inputs to resolutions they do support. This then becomes a question of what is a better scaler, the conexant chip or your HDTV. In the future we hope to see more use of 720p in games because currently even 480p without AA enabled does result in quite a few jagged edges. This brings us to the next issue which is the lack of AA use in current games. None of the titles we've played with (DOA3, Halo, NFL Fever or Project Gotham) enable any of the multisample AA modes supported by the NV2A GPU. The games inherently look very good because of their higher resolution textures and use of pixel and vertex shader programs however aliasing is still present at varying degrees among these titles. Because of the benefits of multisampled AA, enabling NVIDIA's Quincunx mode would not hurt performance all that much, especially at 640 x 480. The only problem that would occur would be an increased blurriness and a blurring of text which would require some workarounds to reduce but it's definitely possible. The use of a higher render resolution such as 960 x 720 (720p) would tremendously reduce the amount of aliasing; for non-HD users, who make up the majority of the Xbox buying population, it would make much more sense to render at 640 x 480 and enable some form of AA whether it be Quincunx, 2X or 4X mode depending on the memory bandwidth usage patterns of the game itself. While all hope is lost of AA to be enabled in this first generation of titles, hopefully we'll see more use of the technology as developers learn from the mistakes of those before them.